Used this on my Honda Shadow 1100. Handles great and getting great wear. Not much driving on wet so only gave a 4 because i don't know but i think it would be good. I won't put more than 500 miles a year on these tires. They will dry rot before I will wear them out. (I really need to sell this bike....) With soft rubber they grip like glue. Softer rubber gives this bike a smoother ride. If you can change your tired to save the fixed labor cost and realize you get lower tread life then this is a good tire at a bargain price. Remember these are not a high performance tire and the faster you ride the lower the tread mileage. Can this be used with a tube, on my 2003, 250 Yamaha Virago? BEST ANSWER: I use them with tubes. In reality, any tire can be used with a tube. If your wheel is not a "mag" type wheel (mag wheels are generally tubeless type) then it has traditional spokes and you must protect the tube from being damaged by the spoke ends protruding through the wheel with a wheel rubber band or duct tape around the inside diameter of the rim. This prevents the spoke nut ends from chafing the tube. 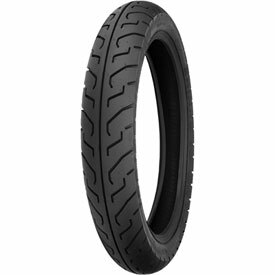 I would not hesitate to use this tire with a tube on my spoke or mag-type wheel. Some mags Tubeless wheel) develop a leak through a porous casting defect and must be remedied with a tube installation. I believe the tire is quite a value, especially considering its cost. Yes, it can be used with a tube. I use this on some of my vintage bikes and it's a decent choice, good for the money.Not sure what your OEM tire size is, be sure to replicate the stock size so you don't run into clearance problems. As long as your valve stem is center on the rim, it will work. You will have to remove the old stem from rim first if it had one. You can use a tube with any tire, just ensure you dont pinch the tube putting the tire on, and verify it beads up all the way. You can use it with a tube but what size of your current tire ? Yes, it can be used with a tube no problem at all.